As it often does, the U.S. stock market trended the complete opposite of what market pundits expected after the election. Clearly, a Presidential election can be the blame for volatility we saw this year before the election. However, instead of crashing down U.S. stocks regained their previous losses quickly. Along with that, investor sentiment shifted from fearful a month ago to much more optimistic as prices trended up. At this point, investors have probably forgotten how volatile markets were the first part of 2016. Once the losses are regained, they eventually forget the stock indexes were down -12% or more in January and February. Investors tend to get optimistic (or even greedy) after prices have gone up and then fearful after prices go down. I am not necessarily a contrarian investor. I mainly want to be positioned in the direction of global markets and stay there until they change. But markets sometimes get to an extreme – increasing the probability of a reversal. At this point, a tactical trader can hedge, reduce exposure, realize profits, or wait until an actual reversal to respond. My purpose of pointing out these extremes in investor sentiment (fear and greed) is to illustrate how investors’ feelings oscillate between the fear of missing out (if global markets have gone up and they aren’t in them) and the fear of losing money (if they are in global markets and they are falling). Fear and greed is a significant driver of price trends. When stock market investor sentiment reaches an extreme, it often reverses trend afterward. We shouldn’t be surprised to see the recent upward price trend reverse down, at least temporarily. 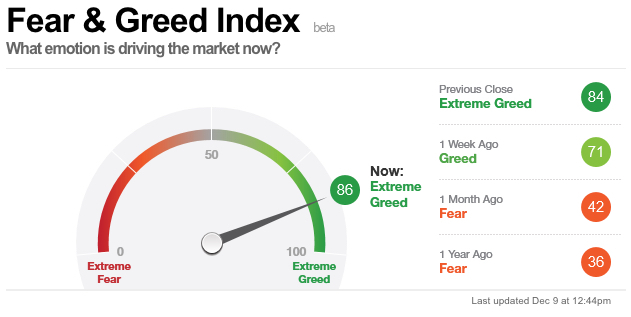 Along with that, we could see investor sentiment reverse from “Extreme Greed” to “Fear” as prices fall. It’s OK to feel and experience your feelings… if you feel the right feeling at the right time. Indicators like this can help investors observe how they tend to feel the wrong feeling at the wrong time. To learn more, below are some of my previous observations about sentiment reaching an extreme greed level of optimism.